World War II began in 1939 when Nazi Germany invaded Poland and both France and Britain declared war on German in the days that followed. The conflict led to two large alliance systems being created between the Allied Powers and the Axis Powers. Both sets of alliance produced some of the most memorable and significant leaders of the 20th century. Winston Churchill was the Prime Minister of Britain during most of World War II and is detailed below. Winston Churchill was born in 1874 to wealthy, aristocratic parents. Churchill’s father was a Lord and an important politician, and his mother was an American socialite. Churchill was not very academic, and was boisterous at school. He did not attend university, but instead became an army officer after graduating from Harrow school. Churchill travelled the world during his time in the army, serving in India and Sudan. He became famous as a political correspondent and wrote books about his time in the army. Churchill continued to serve in the army for many years. Nazi Germany was becoming more powerful in the late 1930’s, and at the same time the English king, Edward 5th abdicated the throne. Edward stepped down as he wanted to marry Mrs Wallis Simpson, who was already married to someone else and this was against the law. When Edward stepped down it caused a number of problems, and resulted in crisis in Britain. Churchill realized the unrest and took the lead in warning the country about Nazi Germany. Further to this, as a result of his political campaigns, and the outbreak of World War II, Churchill became the prime minister of Britain from in 1940. He replaced Neville Chamberlain who had failed to deal with the rise to power of Adolf Hitler through the policy of appeasement. Churchill was well respected and his speeches and radio broadcasts were influential, and helped inspire British resistance against Germany. He was an important leader in the active opposition to Adolf Hitler during the early war days. For instance, his steadfast refusal to consider defeat in the face of Nazi aggression is often remembered as one of his characteristic features. When Britain was facing defeat during the Battle of Britain, he remained a voice of confidence and leadership for British citizens and the Allied Powers. 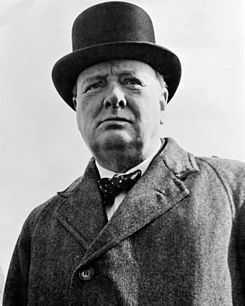 Churchill remained as Prime Minister until the end of the war, when Britain and other opposing countries had secured victory over Nazi Germany. For example, he famously attended the Yalta Conference with other Allied leaders, including: Franklin Roosevelt of the United States and Joseph Stalin of the Soviet Union. He was much loved and was re-elected as prime minister again in 1951, ruling until 1955. Today, Churchill is considered to be amongst one of the most influential people in British history, and one of the most respected leaders in the history of the 20th century.